Every day on her way to school, Jin walks past the same old junk shop, Wong’s Fantastical Shop of Curiosities. She doesn’t pay it much attention until she is given an assignment in school to research a local historical figure who is significant to her. Looking for inspiration, she finds herself in Wong’s, a magical shop with artifacts that, unbeknown to Jin, come to life. Join Jin as she finds out about historical facts and little known cultural figures and enriches her knowledge of just how diverse Hong Kong’s history is. 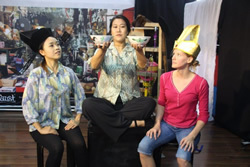 Wong’s Fantastical Shop of Curiosities is performed by a three person cast and is ideally suited for upper primary through to secondary aged students.